The magician shows a handful of printed numeric grids. The magician then has 4 spectators decide on one of the grids. Using the chosen grid, they then pick 4 numbers from the grid. The 4 numbers that were chosen - when added together - totals up to the previously predicted total. Any number can be forced! 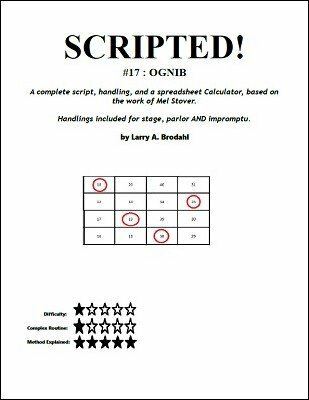 Well, the author of How To Write A Script shows how he used his methodology to write 3 different scripts that successfully explains and entertains with the OGNIB principle. Including some impromptu methods.